Michael (center) plays goalie as one of the Mites on Ice. February is sweet-potato month. As I child I hated sweet potatoes—mostly because I saw them only at Thanksgiving goopily encased in maple syrup and other sweet substances. Once I realized they could be eaten in other ways I became a big fan. My favorite way to consume them is baked simply in the oven, split open, and smeared with a little butter. I’m always on the lookout for something new to do with them, however. Last week my nephew Michael requested that I come up with a recipe that relates to hockey. At eight Michael is enthralled with this sport. He drills and plays every weekend with his fellow Northern Virginia Ice Dogs. I’m impressed with the amount of time these kids spend on the ice—and with the lessons they learn, which are as much about teamwork and sportsmanship as about winning. 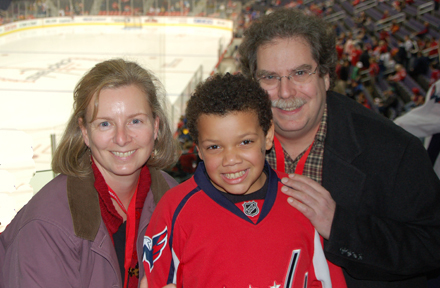 Michael and his parents have season tickets to the Washington Capitals’ games. They started watching the Caps last year when Michael was in second grade and took up hockey. They were delighted to see the team get better and better as the school year went on. 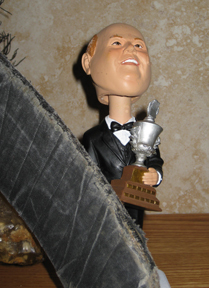 Michael's Bruce Boudreau bobblehead clutches his trophy for Coach of the Year. I have a feeling Michael thinks the Caps’ improved scoring is less due to their coach than to their new eight-year-old fan. Perhaps he’s right. Certainly, the team and its management are going out of their way to encourage family attendance. Michael seldom comes home from a game without a treasured freebie; recently he showed off a Capitals lunchbox of which I am very jealous. And he and his junior team are proud to have been invited to don Capitals uniforms and play as “Mites on Ice” during the intermission at one of the games. Here for Michael and all young hockey fans are recipes for sweet potato hockey pucks (rolls) and sticks (roasted sweets). Maybe one of these days these treats will be available at one of the Capitals’ games……. 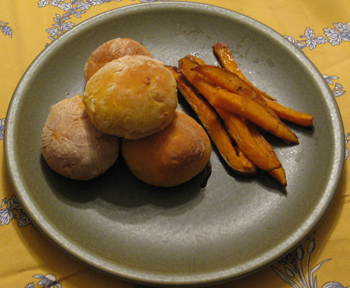 This recipe can be made two different ways, to produce a sweet or a savory roll. I personally prefer the savory version, but it never hurts to have a choice! Wash and trim the sweet potato(es) and cut into manageable pieces. Boil the pieces they are until soft enough to mash. Remove them from the water—but do not throw out the water! As soon as you can, peel the sweet-potato pieces. Mash them thoroughly, using a little of the water if they seem a little dry. Measure out 1/2 cup of the sweet-potato water; you may discard the rest. As soon as the water cools to lukewarm (this will not take long), place the yeast and 2 tablespoons sugar in a small bowl, and pour the lukewarm vegetable water over them. While the yeast is proofing, put the milk in a saucepan over low heat. In a mixing bowl, beat together the mashed sweet potatoes and butter. When the milk is steaming but not boiling, remove it from the heat. Stir the yeast mixture into the sweet-potato mixture, followed by the hot milk, the salt, and 2 cups of the flour. Stir thoroughly, scraping down the sides of the bowl. Let this wet mixture rise in its bowl, covered, until it doubles in bulk (this took me about 1-1/2 hours). When the batter has risen, stir in 1-1/2 cups more flour. Turn the dough onto a floured board and knead it until it is smooth, adding more flour as needed. As you knead, you have a choice. If you like sweeter rolls, try kneading in the cinnamon and sugar. If you like tart rolls, knead in the Creole seasoning and cheddar. Your final product will be a little sticky but not too sticky. Using your hands shape the dough into little balls about 1-1/2 inches in diameter. Place the balls an inch or two apart on greased (or parchment-covered) baking sheets. You should have about 24. Allow the balls to rise on the baking sheets until they double in bulk again, at least 1 hour. Preheat the oven to 375, and bake the risen rolls from 15 to 25 minutes, until their tops are golden. These pucks are best served hot from the oven with lots of butter. Makes about 24 rolls. Wash and trim the sweet potatoes, and cut them into fingers about 1/2 inch thick. If you want to do this step early in the day, let them soak in salt water until you are ready to use them; then drain and blot them. Do not peel them. Preheat the oven to 400 degrees. In a wide bowl, stir together the 2 tablespoons oil, garlic, rosemary, salt, and pepper. Throw in the sweet-potato pieces, and toss them well to coat them with the flavorings. When the oven has preheated, place the coated sweet potatoes on a jelly-roll pan (that is, a cookie sheet with low sides). 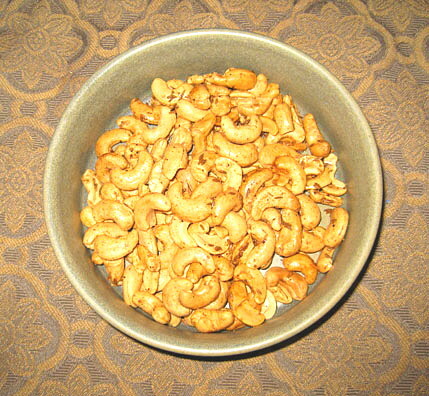 Bake them for 30 to 40 minutes, until they are brown but not black. Turn them at least twice to keep them from burning and sticking to the pan—and be sure to add a little more oil if it is needed to prevent sticking. My favorite part of Louisiana is a place I have visited only by listening to its music, Cajun Country. Southwestern Louisiana is a sort of country cousin to New Orleans. It is inhabited by a mixture of Cajuns (French Acadians who were expelled from British Canada in the mid-18th century and who became peasant farmers in the South) and the descendents of Black Creoles. Their culture and music are a remarkable blend of French, American, African, Native American, and Island influences. Most of the Cajuns speak English, but a number of residents, particularly older ones, speak French dialects as well. My main contact with this area is a radio program called Le Rendez Vous des Cajuns, staged weekly in Eunice, Louisiana. 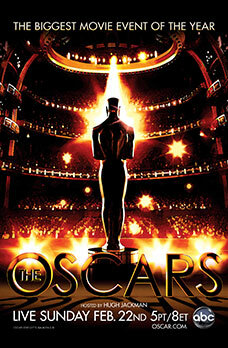 The program is hosted by Barry Jean Ancelet, a professor at the University of Louisiana (Lafayette). It airs partly in English but mostly in Cajun French. It showcases the two major music styles of the area, Cajun and Zydeco (an outgrowth of Black Creole music). Ancelet grew up speaking French at home and has raised his five children in French. He explained in the introduction to the book Cajun Music and Zydeco by photographer Philip Gould (1992, LSU Press) that he only discovered the music of his region while studying in France. A non-Cajun musician who played “la musique de la Louisiane” in Nice counseled the young Barry Ancelet to go home and talk to Dewey Balfa, a legendary Cajun fiddler. Ancelet took the musician’s advice and has been involved in promoting Cajun and Zydeco music ever since. The Rendez Vous began in 1987. It is part of a revival of French language and culture in southern Louisiana outlined by Barry Ancelet in two journal articles, “Negotiating the Mainstream: The Creoles and Cajuns in Louisiana” in The French Review (Volume 80, number 6, 2007) “Cultural Tourism in Cajun Country: Shotgun Wedding or Marriage Made in Heaven” (Southern Folklore, Volume 49, number 3, 1992). French-speaking children Louisiana schools were not only taught in English but forbidden by law to speak French anywhere on school grounds. Over the decades this bilingual culture started losing a great deal of its identity. Beginning after World War II and most strongly since the late 1960s southern Louisiana has seen a revival of popular and official interest in French culture and in the music and folk practices that gave much of this colorful area its personality. Eventually, the question of language for the Rendez Vous was settled resoundingly in favor of French, although no one is a purist, and English is smattered throughout the broadcasts. The music played is in some ways new to northern listeners and in other ways familiar because of its multicultural and folk roots. Listening to it is like being invited into a new neighbor’s living room and being enchanted to find that you have a lot in common with each other—but also a lot to learn from each other. We make large quantities of this recipe (x10) for those who gather together to eat after our traditional Ossun Mardi Gras Run, a procession of revelers in masks and brightly-colored costumes that winds its way through the rural neighborhood visiting, singing, dancing, and collecting the ingredients for the gumbo. Some households contribute rice, onions, parsley or sausage, but ideally the offering is a live chicken that the revelers are expected to catch in the open fields. This is not easy to do, and the hilarity resulting from grownups and children alike running through ditches, over barbed-wire fences and under barns is part of what the households receive in return for their generous gifts. The procession is typically about 12 to 14 miles long with 15 to 20 performances. By the end of the day, the revelers have developed a mighty appetite and are eager to eat the fruits of their labor. I wouldn’t want to try replicating the Ossun, Louisiana, Run in Hawley, Massachusetts, where the snow would definitely cramp the style of revelers. I love the way in which food, music, terrain, and celebration mingle in this story, however, and I think anyone who lives in the country can identify with the community spirit behind the Ossun Run. 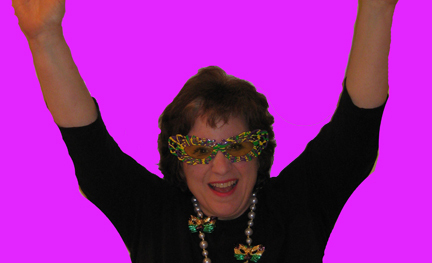 I encourage readers to explore the world of Cajun and Zydeco music for themselves. 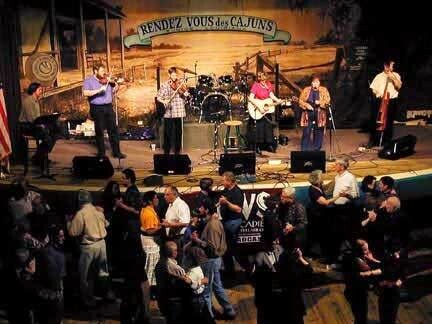 Listen to the Rendez Vous des Cajuns live via the internet one Saturday on KVRS-FM. Buy a CD of Dewey Balfa, Iri Lejeune, Clifton Chenier, or any one of the other wonderful musicians Cajun Country has spawned. An LSU website devoted to Cajun and Zydeco music is a good place to start looking. YouTube has many clips of these musicians. It also offers an authorized clip of the film Dance for a Chicken: The Cajun Mardi Gras by Pat Mire, which depicts a Mardi Gras Run—as well as link to the site on which you can view the entire film. While you’re listening to your music OF COURSE you’ll need something to eat. Here is Maude Ancelet’s gumbo recipe to get you dancing. According to Barry Ancelet the roux is the most important part of the gumbo. I have used a lot of his words in the instructions that follow because they reflect his passion for the cooking process. This basic roux recipe can be used for stews and sauces piquantes as well as gumbo. If you want more roux flavor in your gumbo, you may increase the amount of roux, but be sure to observe the same proportions: always start with more flour than oil. Set the roux vegetables in a bowl by the stove. They need to be ready to throw into the pot to “stop” the cooking at the crucial moment. Heat the oil in a heavy pot. When the oil is very hot, add the flour. Keep the fire on medium. Constant stirring is a must. Don’t answer the door if there’s a knock. Don’t answer the phone if there’s a ring. A roux needs your undivided attention. Your eyes should be riveted to the inside of the pot the whole time. About halfway through the cooking process the roux will become more liquid, but it will thicken again to paste consistency as it nears completion. Making a roux shouldn’t take longer than 15 minutes. Remember, stick with your stirring spoon. It’s easy to burn a roux but just as easy to succeed with diligence and patience. 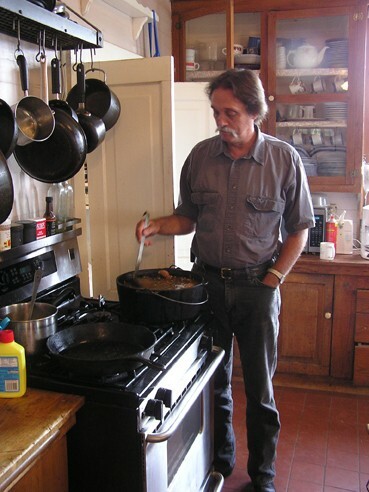 As you become experienced, you will find that you can cook with a fairly high fire, but at first it is safer to reduce the heat until you get a feel for what is called “stopping the roux.” This involves recognizing the desired color (a rich brown for gumbos, a golden brown for sauces); adding the chopped onion, bell pepper, celery, and garlic; and removing the pot from the fire, still stirring all the while. The heat of the roux cooks these ingredients and gives the roux a seasoned taste. After you have added the vegetables and removed the pot from the heat, you are ready to continue with your gumbo. Slowly add the gallon of warm water, stirring. Return the pot to the heat and bring it to a boil. Lower the fire and let the mixture simmer for 15 minutes. While it is simmering, in a heavy skillet brown the pork sausage well. Remove the sausage, and cut it into bite-size pieces. Add it to the gumbo. Drain the grease from the frying pan, and add about a cup of water to get up the residue from the sausage. Add this to the gumbo for flavor. Add the remaining vegetables and the chicken, plus the salt and the pepper(s). Let simmer for 35 to 40 minutes. Add the chopped onion tops and parsley. Make the gumbo ahead of time so the flavors can steep. Serve over hot rice. 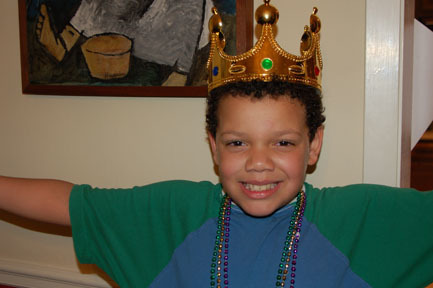 Mardi Gras is a time of taking chances—so I decided to try once more to make a King Cake. Readers of this blog may recall that I tried making one at Epiphany and was less than thrilled with the result. My mother taught me to persevere, however, and luckily King Cakes are eaten in Louisiana from Epiphany straight through to the beginning of Lent. I sifted through many different recipes identifying the cake elements that most appealed to me and went to work. I’m actually very happy with my new cake, although the filling gushed into the middle so I didn’t end up with the classic ring. Mine was more of a round blob. Nevertheless, it puffed up beautifully and tasted like a sweet, creamy coffee cake. Like the previous King Cake, it concealed a quarter (more authentic bakers would use a bean or a toy Baby Jesus) within its yeasty folds. The person who found the quarter in his or her cake was crowned King or Queen for the Day. So—from my house to yours—here is a King Cake recipe. The biggest trick is to take your time; since it uses yeast this cake can’t be rushed. It’s a big cake so you’ll help your sanity and your waistline if you have young eaters in the house. Feel free to cheat a little and ensure that one of them gets to wear the crown! As you can see from the picture below that’s what we did at our house. Place the yeast and the 2 teaspoons sugar in a small bowl. Cover them with lukewarm water, and allow the yeast to proof for 10 minutes. In a large mixing bowl combine 3-1/2 cups of the flour, 1/2 cup sugar, the nutmeg, the salt, and the lemon zest. Stir them together thoroughly (I like to use a whisk for this). Make a well in the center of the dry ingredients, and pour in the yeast mixture and warm milk. Stir in the egg yolks, and combine the mixture thoroughly. When the batter is smooth, beat in the butter, 1 tablespoon at a time. (This takes a little while but eventually works.) Place the dough on a floured board, and knead it, adding more flour as needed. Your dough may end up slightly sticky but should not stick to the board. Knead the dough until it feels smooth; then knead it for 10 minutes more. Don’t be discouraged. This kneading is what gives the final product its wonderful puffiness. Place the dough in a buttered bowl, cover it with a damp cloth, and allow it to rise until it doubles in bulk. This will take at least 1-1/2 hours and perhaps more. When the dough has risen, punch it down. Using your fingers, pat and stretch the dough to shape it into a long, short rectangle, at least 24 inches long and 6 to 8 inches wide. Let the dough rest while you beat together the ingredients for the filling. If you want to, place a quarter or a bean in the middle of the dough. Gently spoon the filling down the center of the strip of dough. Fold the edges up over the filling to form a cylinder that encases the dough. Pinch the edges together to seal the filling as well as you can. Your seams don’t have to be perfect; they will be hidden by the glaze. Pinch the ends of the cylinder together to form a ring, and place it on a silicone- or parchment-covered baking sheet. Let it rise, covered, until it becomes puffy, about an hour. Preheat the oven to 375. Bake the King Cake for 25 to 35 minutes, until it is golden brown. Remove it from the oven, and allow it to cool completely. For the glaze: beat together the sugar, vanilla, and lemon juice, adding a bit of water if needed to make the glaze thick yet pourable. Divide the glaze in three, and color the three glazes purple, green, and gold. Drizzle them artistically over your cake. Next Tuesday is no ordinary Tuesday. 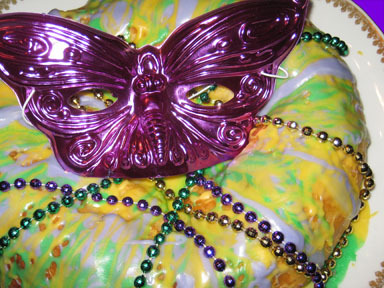 It marks the holiday of Fat Tuesday (Mardi Gras), also known as Shrove Tuesday and Carnival. The day before the beginning of Lent was officially added to the Catholic calendar in 1582 by Pope Gregory XII. The good times have been rolling ever since. Mardi Gras is a day of excess. Diets are broken. Jazz is trumpeted through the streets. Costumes are worn. In New Orleans the day is the highlight of the year. The Louisiana-based company Zatarain’s (manufacturer of my favorite Creole seasoning) is working on a petition to ask Congress to make Mardi Gras a national holiday. This campaign may just work: ever since Hurricane Katrina many Americans have felt a special kinship Louisiana and its residents. 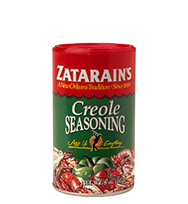 I obtained this recipe from the helpful people at Zatarain’s. The colors of Mardi Gras are purple, green, and gold so I made the recipe more festive by using baby purple and gold potatoes. I threw in a bit of the tops of the scallions to give the salad a touch of green. 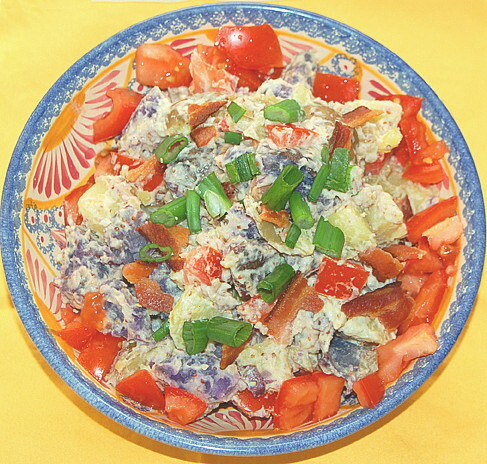 The salad is refreshing and not too heavy, with a little zing; the Creole mustard has extra vinegar so there’s no need to add that to the mixture. Boil the potatoes in lightly salted water until they are fork tender but not soggy. Drain and quarter them. In a bowl, combine the mayonnaise, mustard, sour cream, Creole seasoning, and sugar. Add the warm potatoes, and toss to coat them with the dressing. Add the tomatoes, bacon (if desired), and scallions, and toss lightly. Cover the salad, and refrigerate it for at least to hours to let the flavors blend. Serves 12. 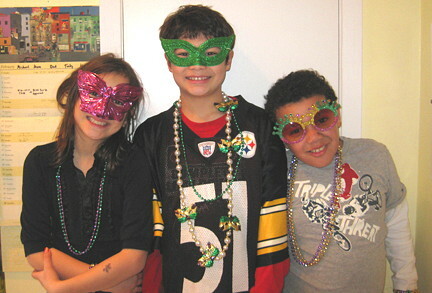 Getting Ready for Mardi Gras: Anna, Gaby, and Michael don masks and beads.